In the points and miles world, we commonly talk about complicated schemes that are ever-changing. However, that doesn’t mean there aren’t easy ways to maximize your money. It’s true, manufactured spending methods and credit cards with large spending requirements usually reap better rewards, but some people don’t have time for all of that. 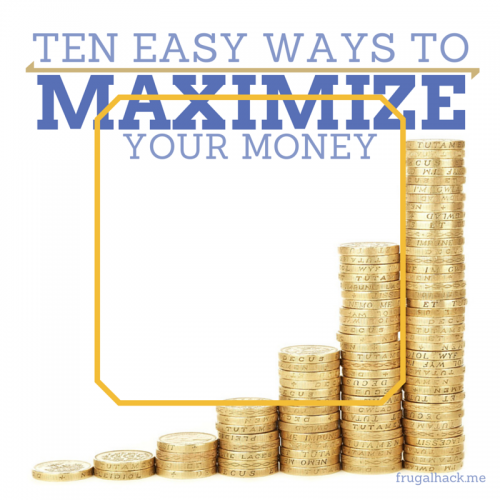 Because of that, I put together this quick post on 10 easy ways to maximize your money. Unless you stash all your cash in your dresser, chances are you let a bank or credit union hold onto it for you for safe keeping. If that’s the case, you might as well put it in an interest earning account, since it’s just sitting there anyway. That way at least you’ll get something out of the banking relationship.If you’re in the West Michigan area, I suggest Lake Michigan Credit Union. They offer 3% APY interest on your checking account balance, up to $15,000. The only requirements are that you set up a direct deposit and you make 10 debit card transactions per month, but that’s easy enough. If you don’t live in that area, I’m sure there are other local options. If not, there’s always Capital One 360 which earns .75% APY interest. Buying a gift card at a reduced price through Raise or a different gift card retailer, is a great way to save money on a purchase. For example, let’s say you wanted to purchase a $200 item at Bed Bath & Beyond, you could save 11% by purchasing a gift card then using it to purchase your product. Portals are a necessity for all online purchases. If you don’t know what a portal is, it’s basically a referral link for a website that earns you a percentage back on your website purchases after clicking through. The best part about portals is that you can double/triple dip with gift cards. Using the example mentioned above, if you used a portal on top of using that gift card, you could earn an extra 5% cash back on your purchase. That’s a total of 16% off before using any actual coupons (With BB&B you’re guaranteed to have a 20% off coupon, because all you need to do is sign-up for their newsletter). Many people who don’t know about manufactured spending or people who don’t want to bother with it, worry about hitting minimum spending requirements (I had a problem with it before learning about travel hacking). However, not all cards have minimum spending requirements, or the requirements are very low. Take the Barclaycard US Airways card for example, you earn 40,000 Dividend Miles after your first purchase. Easy. Chase Freedom offers a $100 sign-up bonus after spending only $500. If you transferred 3 months worth of spending onto that one card, I don’t think you’d have an issue hitting that amount in 3 months. I say “a little” because I talking about manufactured spending with the underwear factor. There are manufactured spending techniques that you can basically set and forget. They don’t require much work on your part, they often times don’t cost much (if any) money to do, and you can use these techniques in your underwear (e.g. Serve online loads).There are more complicated manufactured spending techniques that can be more rewarding, if you’re willing to put the time in. Most credit cards earn rewards on purchases and even 1% cash back or 1X miles on a purchase is better than nothing. If you don’t have one, get one, but make sure you can pay your balance off in full every month! Different cards have different category bonuses, so it’s important to know what yours are. If you don’t want to track them, I suggest getting the app Wallaby. That is an awesome app that will keep track of your credit cards and let you know which one will earn you the most points and miles at different stores. If you don’t have a card, look at the last sentence on number 6. Most bank accounts offer sign-up bonuses when you open a new account with them and many of these banks don’t check your credit report. Because of that, you don’t have to worry about a hard pull like you do with credit cards. If you are interested in signing-up for a new bank account, Will, at Doctor of Credit, has an up-to-date list of all the current sign-up bonuses available. There are many websites devoted to finding deals and sharing coupons. Often times, there is a deal for the exact same item you are planning on purchasing, so it’s important to try to find the best price. You can learn about finding the best deals here and here. Never pay full price for anything (at least try not too)! Many companies will match your contribution to your retirement fund, up to a certain percentage. So, obviously the best way to maximize your money in that situation, is to contribute the maximum percentage. This isn’t an instant way to maximize your money, but in the long run it’s worth it.